Merit Boddie [Marigolds]: Quadrille #1, Old Sailors Never Die, Quadrille #3, Quadrille #4, Happy Christmas To You, Christmas Song. Daniel Hobson [Joy Bells]: Quadrille #2, Bye Lola Till Morning, Masquerade Walking Piece. George Sweeny [Maple Leaf Calypso Band]: Good Morning, Bull Dog Goin' Bite Me (#2). Walter Roberts: Do My Jolly Boy, Bear Away Yankee Bear Away Boy, Blow Boy Blow, Caesar Boy Caesar, Yankee John Stormalong. Reginald Syder: Feeny Brown, See Me Nanny-O, Long Time Ago, Bull Dog Goin' Bite Me. Anita Wilkens: One Two Three, Aunty Nanny Thread the Needle / Loose Me Johnny Loose Me. Santoy [Red Ants]: The Tragedy at Brimstone Hill, Nevis Without A Payday, Poor Josiah. Rosaly Jeffers: Mr Dog He Came to Town, Willie Boy, Baby Rock Away. Samuel Hanley [Joy Bells]: Speech / Streets of Laredo. Louis Hanley, Joseph Hobson [Red Ants]: Mr Highback. Eldred Decent [Lalaps Band]: Rag Time unidentified. The music played in many of the smaller English-speaking islands of the Caribbean has received occasional exposure in anthologies of recordings and writings on the subject. Not until the succession of CDs devoted to Alan Lomax’s 1962 field trip in the region, however, has there been a concerted effort to present the vernacular traditions of particular islands. In the Lomax Caribbean Voyage series, this particular anthology has a unique asset - Roger D Abrahams, who was present at the recording sessions made the selections and has written the notes. He was in Nevis conducting long-term research into the black folk culture of the island, and its neighbour St Kitts (St Christopher). This is singular for a Caribbean Voyage release, for no other compilation in the sequence has the advantage of being chosen by a participant in the sessions. The notes, therefore, are specially informative, describing not only the music in context but the way in which Alan Lomax conducted his research. The custom of Christmas music in St Kitts and Nevis has been reported since the 1890s (St Kitts), and especially by Abrahams in the 1960s-'70s. Such seasonal music forms the core of this collection. The exceptions being chanteys, old-style children’s game songs and elements from Tea Meeting ceremonies. 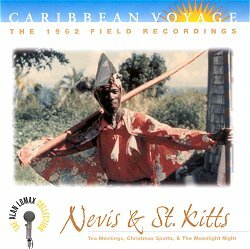 Excluding three tracks, devoted to St Kitts festive music, all the recordings in this CD were made in Nevis. The chantey-singing fishermen, under the leadership of Walter Roberts or Reginald Syder performed songs used for boat hauling or while sailing, many reflecting past rather than contemporary practice. Notwithstanding, versions of several of the songs are also featured in Abrahams’ book about the tradition: Deep the Water, Shallow the Shore: Three Essays on Shantying in the West Indies, (Austin, University of Texas Press, 1974). The first element of the title of this study being the chorus of Bear Away, Yankee, Bear Away, Boy. Versions of several of the other chanteys are in both the CD and the book: Feeny Brown / Blow Boy Blow / See Me Nanny-O / Yankee John, Stormalong / Caesar Boy, Caesar. The lyrics to the latter refer to the drum that sometimes accompanied when launching and breaching boats on the shore. The session that produced these performances was specially organised in a rum shop in Newcastle (which, Abrahams reports, is the second most populous village in the island). This artificial situation, required to produce good recordings, had its drawbacks, as well as disparate performers striving to recall songs from their past experience it attracted background participation by onlookers. In the West Indies chanteys are used not only for purposes associated with the sea, but other collective manual work, such as house moving. The game songs One, Two, Three / Aunty Nanny Thread The Needle / Loose Me, Johnny, Loose Me are sung by a group of children led by Anita Wilkens. Again, the extra information from Abrahams helps understand the context of the performances. They come from the south side of Nevis, which in 1962 had yet to receive an electrical supply. This shelter from ‘modernity’, he suggests, may account for the liveliness of the singers and the retrospective nature of the repertoire. Activities in the battle between ‘order’ (or decorum) and ‘chaos’ - personified respectively by the chairmen and hecklers - are mediated by the diplomacy of a ‘King’ and ‘Queen’. Orations by ‘grandiloquent speech-makers’ and ‘effusive toastmasters’ - represented here by Mr Highback performed by Louis Hanley and Joseph Hobson - were often made to the accompaniment of a fife and drum band, as is the case with this presentation. Other elements in these ceremonies include drills (singing-dance games or lullabies) and songs. Baby, Rock Away - performed by a group of women led by Rosaly Jeffers, characterises the former while Mr Dog, He Came to Town and Willie Boy, by the same group, are examples of the latter. To the accompaniment of guitar and cuatro, a singer named ‘Santoy’ performs three local ‘calypsos’; repertoire that might also feature at Tea Meetings. He claims them as his own compositions but two at least - The Tragedy At Brimstone Hill and Nevis Without A Payday - were written by Charles Walters, a famous local balladeer. Poor Josiah may be a Santoy original. Similarly, such songs were featured during the Nevis Christmas-New Year masquerade season, alongside other styles, including Nyegar Business (distinguished here by the rendering of Mr Highback) - a presentation characteristic of cross-dressing gossipers. Indeed, the balance of the selections in the anthology revolves around the Christmastide festivities. Samuel Hanley’s depiction of a ‘cowboy’ is in this ‘Christmas Sports’ tradition, with a boastful Speech and sung version of the Streets of Laredo. The majority of the festive performances, however, are quadrilles and other instrumentals by fife and drum or string bands. Although not identified by name in the CD booklet, three groups were recorded at Gingerland, Nevis. The Marigolds a string band led by Merit Boddie (wood flute) performed at the first session in the island on 9 July 1962. The Joy Bells a fife and drum band led by Daniel Hobson (fife), and the Red Ants another fife and drum band led by David Freeman (fife) participated in the final recordings on 11 July. (A performance by the latter band is in Songs of Christmas from the Alan Lomax Collection, Rounder 1719; this was the same occasion at which Santoy recorded ‘calypsos’). The CD opens with two quadrilles, the first rendered by the Marigolds string band, the second by the Joy Bells fife and drum band. Aurally, this serves to contrast the instrumentation with the Marigolds line up featuring Merit Boddie (leader) wood flute, Hubert Sanders boom pipe (baha), Samuel Hanley guitar, Kelvin Liburd guitar, James Grant guitar, Joe Liburd cuatro, Alfred Williams mandolin, Anderson Duporte banjo, and Edmond Henderson gourd (gyro). The Joy Bells comprised Daniel Hobson (leader) fife, David Freeman second fife, Ernest Archibald kettle drum and Alfred Morton bass drum. The compilation includes two more selections by the latter group - Bye, Lola, Till Morning and Masquerade Walking Piece. There are five additional performances by the Marigolds: Old Sailors Never Die, Quadrille #3, Quadrille #4, Christmas Song and Happy Christmas To You. This last piece, Abrahams notes, is the only representation of ‘serenading’, a mountain tradition of singing very old songs in part during the season. Unfortunately there is no vocal example of this practice, the one community maintaining the custom live at Fountain Village, high on Mount Nevis, and thereby were not aware of Lomax’s recording activities. There was only one session in St Kitts, held on 2 July, and Lomax paid a visit to Anguilla before arriving in Nevis, just over a week later. As Roger Abrahams observes, the performances obtained in St Kitts are specially characteristic of situation recordings. Here the atmosphere is relaxed and more representative of the vitality of a masquerade. Two ensembles were recorded at Irishtown. The first was the Lalaps Band, a fife and drum unit led by Selwyn Wathey (snare drum) accompanied by Joseph Reid bass drum and Eldred Decent fife. Their performance of Rag Time includes crowd participation and conjures up a masquerade with ‘old talk’, dancing and music. Some of the spoken interjections are risqué in character, others satirical. The second aggregation was the Mapleleaf Calypso Band, a string orientated group comprising George Sweeny guitar, Alvin Prentice guitar, Joseph Reid boom pipe and Selwyn Wathey spoon. Their performances are songs rendered in a free flowing manner, especially Good Morning, a ditty that serves as an introductory strain on Christmas morning when masqueraders and other participants begin their festivities. Bull Dog Goin’ Bite Me is another version of the familiar West Indian sea chantey, but this realisation is also in the Christmas spirit and demonstrates the way in which repertoire can move from one tradition to another. There is a great deal to investigate and enjoy in this anthology, which at last allows a glimpse of a highly vibrant culture long neglected in surveys of Caribbean music. The playing time is very generous and the production excellent. This is an innovative and satisfying collection and recommended for purchase by all with an interest in the region and its musical traditions.